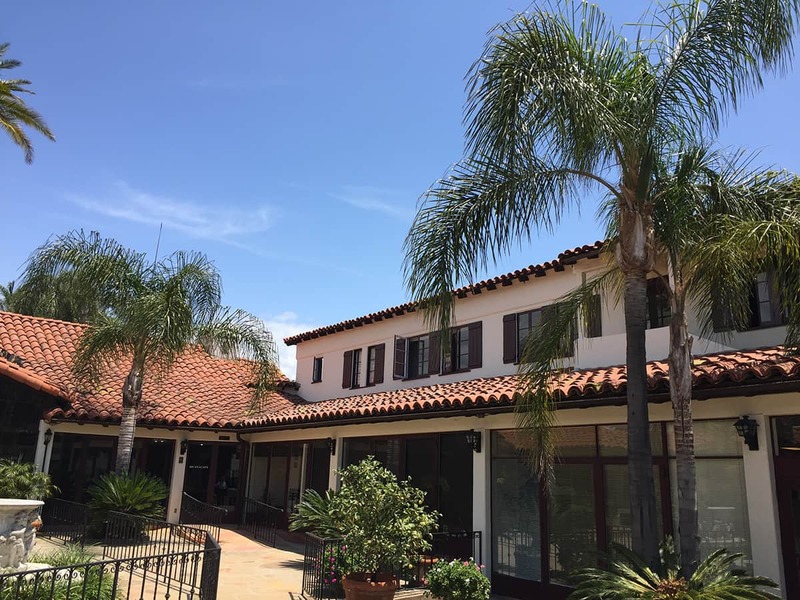 The Queen Palm has been a main contributor to Santa Barbara’s lush, subtropical look for over 100 years. Native to Brazil and Argentina, it was introduced into our town in the late 1800’s and soon became widely used in public and private landscapes and as a street tree. Consequently, it is one of the most-planted species of street tree here, second only to the Jacaranda. Its botanical name is Syagrus romanzoffiana. 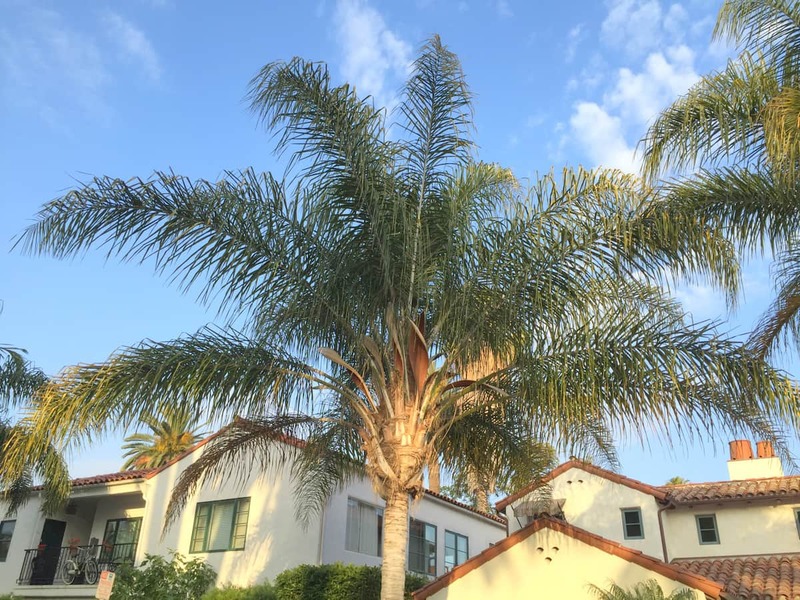 The Queen Palm is admired for its long, graceful, feather-like fronds, for its adaptability to a wide range of often difficult soil and growing conditions, and because its roots do not heave up sidewalks or pavements! Under good conditions, it can grow up to two feet a year; growth slows as the tree ages, but it can eventually reach a height of 50 feet. It can flower and produce fruit every year; the fruit is edible and tastes sweet, but there is little flesh over the hard seed. The Queen Palm’s fronds often develop a light-green or yellow color, known as “chlorosis”, due to poor nutrition. This problem can be easily corrected with specially formulated palm fertilizers containing nitrogen, manganese, magnesium and iron. To maintain a tidy appearance, Queen Palms do require annual pruning in order to remove both dead fronds and large masses of fruit. But, the decorative value of these lovely trees far outweighs the relatively little care required. 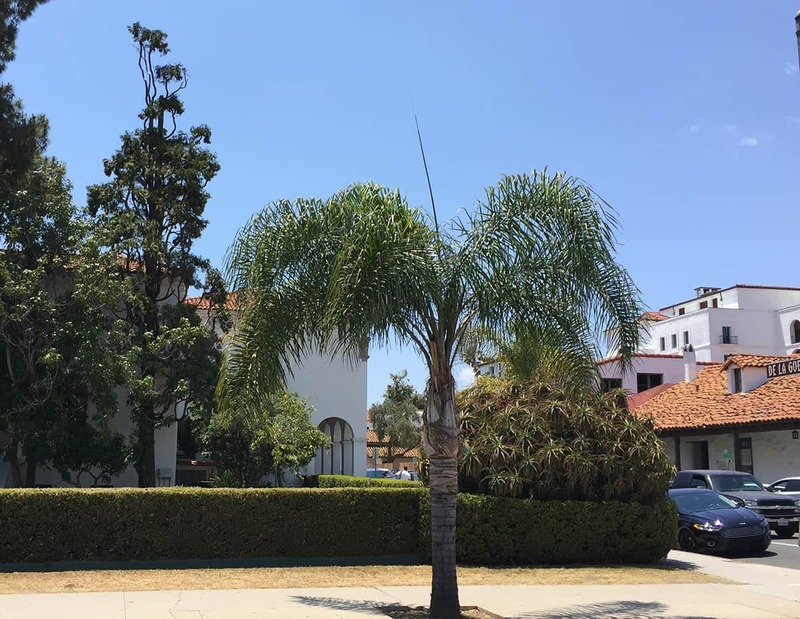 Queen Palms can be seen throughout Santa Barbara, especially along streets in the downtown area and the Upper East Side. If you want to create the feeling of a subtropical paradise, plant a Queen Palm – or two! The Tree-of-the-Month article was started by Santa Barbara Beautiful to increase awareness and appreciation of Santa Barbara’s many outstanding trees, in conjunction with their ongoing partnership with the City Parks & Recreation Department to fund tree planting along the City’s streets, which has resulted in the planting to date of more than 12,000 street trees.